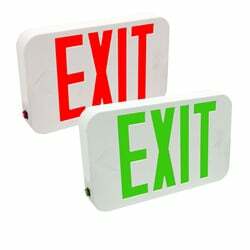 ExitExpo.com has many variations of exit signs available. All of the variations have a few things in common. We only offer designs that comply with building code requirements, fire safety codes, OSHA, and insurance requirements. The units are designed to be energy-efficient and long-lasting, saving you money on energy costs and maintenance. Most of the designs use energy-efficient LED while others are self-illuminating exit signs, meaning they don't require electricity. There are two types of self-luminous exit signs: photoluminescent exit signs and tritium exit signs. 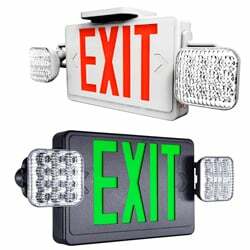 All of the exit signs are easy to install with most including kits so in-field configuration of arrows and faces is a snap. The easiest way to find the right exit sign for you is to navigate by the context the sign will be installed in, via categories. For example, you will see indoor or outdoor locations, cold-rated, wet-location rated, or hazardous location rated. 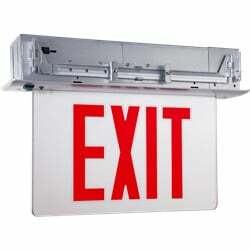 You will also see that we also organize the exit signs by key distinct attributes such as aluminum housings, vandal-proof housings, or the architectural appeal as with the case with edge-lit exit signs or custom exit signs. Lastly, there are categories devoted to special or distinct use cases such as City of Chicago exit signs, New York City Approved Exit Signs, Made in America Exit Signs, and Braille Exit Signs. 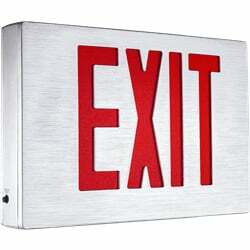 We are delighted to help you find the right exit signs for your situation. For common questions, our Exit Sign FAQs below can help get you off to a great start. 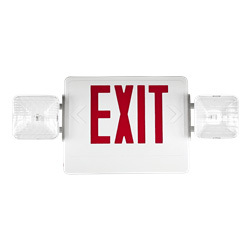 Do battery powered exit signs exist? The answer is technically no, however, in the abstract sense they do. Typically we get this question in situations where the location of installation doesn't have easy access to electricity and what the situation could best use is an exit sign that is not dependent on hard-wired electricity. In these situations there are two options, each with their own pros and cons. 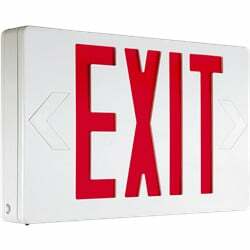 Photoluminescent exit signs, also known as glow-in-the-dark exit signs, are charged using consistent ambient lighting shining on the face of the sign. There are certain requirements that must be followed with this type of sign. If you use this type of sign you -must- ensure that they are UL924 certified and not the 'yard sale' grade signs. 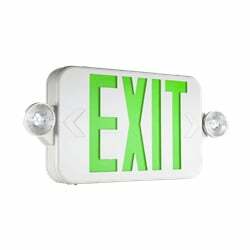 The other type of exit sign that doesn't require electricity is a self-luminous exit sign, also known as tritium exit signs. This type of sign uses radioactive isotopes in phosphorus coated tubes to generate light for 10-20 years. We have both types of these signs. How long do exit signs last? 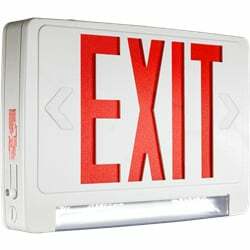 Standard Indoor LED exit signs last approximately 7-10 years. Premium models will reach greater than 10 years. Self Luminous Exit Signs last between 10-20 years. Photoluminescent Exit Signs don't technically have an expiration date because there are no moving parts. They do however need to be cleaned with the correct cleansers to ensure that they don't experience light absorption reduction such as would be caused if you, for example, sprayed an 'anti-dust' solution that contains wax. 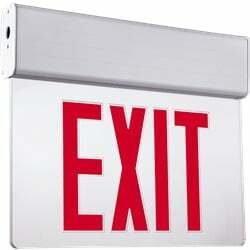 Light Emitted Capacitor or LEC exit signs are generally rated to last for greater than 15 years.